Casa Elder has been a flurry of activity this last week. Andy and I decided to start searching for a home. Our very first purchased home. I’ll be the first to admit it: It’s hard for me to make a temporary place feel like home. So, I’ve really struggled in our little apartment to put pictures on the wall, and figure out a good organizational scheme for our dishes, and find a place for all the boxes, let alone go through all the boxes… You won’t be here forever…Is it worth the effort? I’d hear the whisper every time a smidgen of motivation would work it’s way to the surface. More often than not I decided it’s not. I know this laziness is probably some evil spirit rearing it’s ugly head, and truthfully, it’s something I struggle with. So, I figured out how to solve our problem: Buy a House!! If we owned something, I would surely care for it! I would surely care how it looked, and smelled, and felt. Well, I certainly hope so. Because after less than 2 weeks of looking, we’ve found a house, fallen in love and have negotiated a price. We don’t have the keys. Nothing is etched in stone. So I’m trying to keep my hopes from soaring too high. Anything could happen in the next 30 days. We know that. Between appropriate words cautioning against hastiness, my mom also had great advice about going for it: don’t over-think. If it’s the right house, look for the blessings. And they certainly abound. If everything goes as planned, we’ll be moving while I’m moderately pregnant, not giant pregnant. We’ll have time to settle in before Baby comes, and we’ll have space for visitors. We were prepared for the long-haul. We were ready to search for months, to feel frustrated, and get let down. As Andy and I discussed our offer, we couldn’t help but look a gift horse in the mouth. What’s wrong with this house? How could everything have possibly happened so fast? Many houses we looked at (in our price range) were a disaster. They would need a lot of work to make them livable. This house? Practically perfect condition: new carpet, paint, windows, hardwood floors; a third of an acre; privacy; safety; good schools… Are we sure about this?…We must have missed something! So, here we sit. Stunned. In awe of this blessing. Optimistically cautious. We have no reason to expect anything to fail, but we know home sales fall through all the time. There is still the home inspection, the appraisal, and a million other hurdles to leap. We’re praying that the most they produce is a small stumble. I can’t post too many photos, since it’s not ours yet, but here’s just a taste. 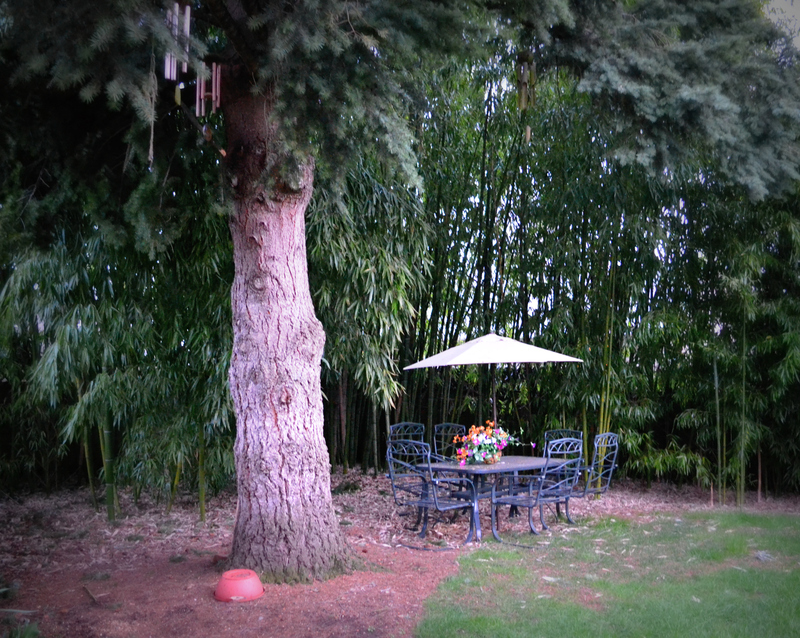 The back yard is lined with bamboo. Honestly, it took me by surprise. My surprise quickly turned into delight. I can just imagine Mo and her Sister pretending that this particular corner is a jungle. Not to mention it provides a ridiculous amount of privacy and soaks up quite a bit of moisture from the yard (dampness: the joy of the Portland area). It seems a little bit magical to me. Prayers are greatly needed and well appreciated. This entry was posted in Uncategorized and tagged New Home. Bookmark the permalink. I’m so excited for you to be buying a home! Good luck!